During September of 2010 the Catholic University of Puerto Rico, Ponce Campus, hosted the exhibition called “THE EARTH: A HUMAN HABITAT”. 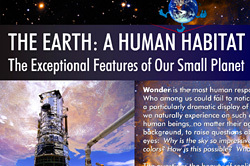 This activity presented the exceptional features of our planet using multiple posters and five lectures. This exhibition has traveled the World and it was prepared by EURESIS (Association to Promote the Scientific Culture and the Scientific Work). EURESIS is a no-profit association of people professionally involved in different branches of science, technology and education as well as in University and Industry Institutions. Locally the exhibition and lectures were organized by Dr. Fabrizio Acciaro from the “Instituto de Doctrina Social de la Iglesia” and sponsored by the Dean of Sciences. The posters were exposed in the main hall of the General Library. The activity started on September 2nd with the opening lecture of Dr. Giorgio Ambrosio, a scientist from the Fermi National Accelerator Laboratory, in Batavia, Italy. Dr. Ambrosio is part of EURESIS and was involved in the development of this exhibition. As part of the agenda other local scientists also talked about the physics, geology, chemistry, and biology of the Earth. Dr. Fernando Gilbes was invited to give the lecture titled “Geological Connections of the Earth”. 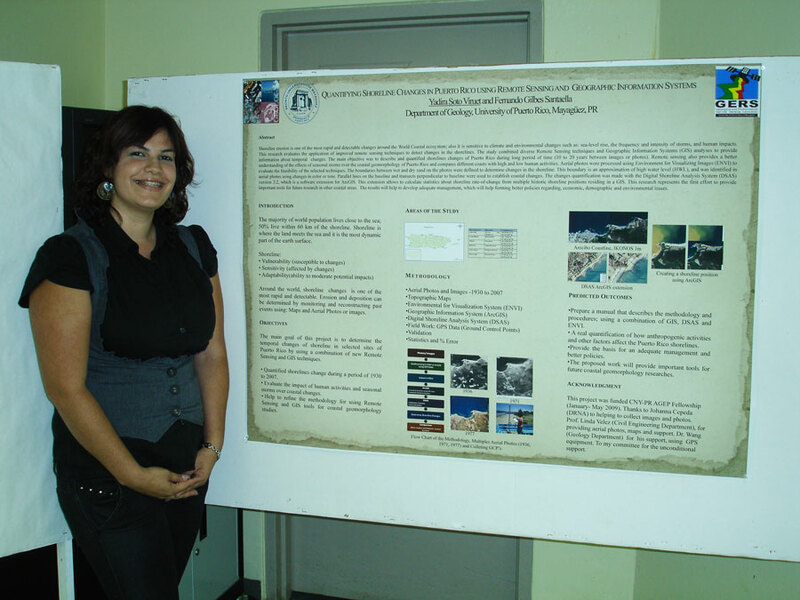 This presentation took place on September 16 of 2010 and presented different topics of geology that are covered by the posters of the exhibition. That day the Vicente Murga Amphitheater was packed of students and teachers from several high schools of Ponce along with students and professors from the university. 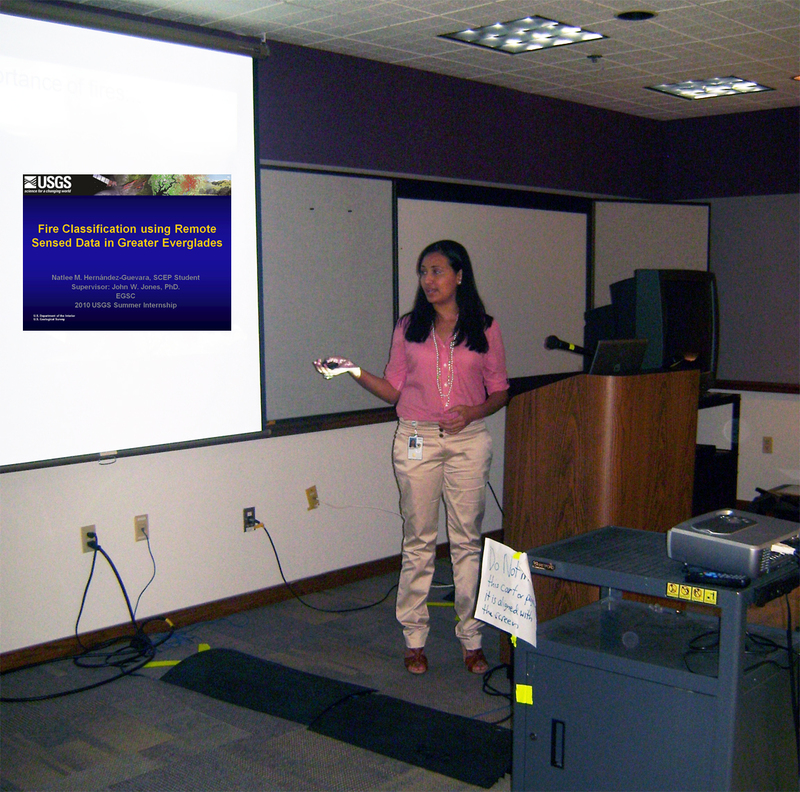 It was the third summer internship of the graduate student Natlee M. Hernandez-Guevara with the U.S. Geological Survey, but this year 2010 was as SCEP (Student Career Experience Program). As in previous summers, she was part of the Eastern Geographic Science Center, working under the supervision of Dr. John W. Jones, a geographer of the agency. This summer she used Remote Sensing and Geographic Information Systems tools to classified fires on the Florida’s Everglades. The classifications were based on feature extractions, variables of importance, and decision trees. This tool will help to improve the existing fire database, with precise boundaries, edges and location of the fires. All this work was presented by Natlee on the Greater Everglades Ecosystem Restoration (GEER) 2010 bi-annual conference. Andrey Koch is a researcher from the College of Oceanic and Atmospheric Sciences (COAS) at the Oregon State University working with ocean circulation models in coastal areas. He is original from Russia and has particular interests for learning the research in other regions. Such motivation moved Andrey to request NOAA funding to come to Puerto Rico during July 22 and 23 of 2010. During the first day he met with Jorge Capella who works as a research consultant in the Department of Marine Sciences (DMS) at UPRM. Jorge gave Andrey a broad overview of research being conducted. He also met with Julio Morel who is professor in the DMS and principal investigator of the Caribbean Regional Association (CaRA/CariCOOS). They talked about the projects in observational and modeling efforts being applied to the east Caribbean and areas adjacent to Puerto Rico as part of the CariCOOS. Also, several graduate students show him the modeling at the Caribbean basin with coupled ADCIRC and SWAN models. During lunch time he also met Dr. Yasmin Detres, researcher of the Bio-Optical Oceanography Laboratory, and Dr. Juan G. Gonzalez-Lagoa, a retired professor and an expert in plankton taxonomy and dynamics. 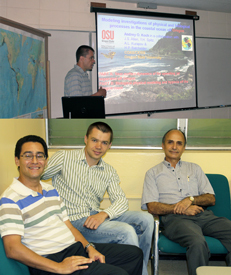 In the afternoon Andrey offered a seminar at the DMS-Magueyes Island entitled “Modeling investigations of physical and biological processes off the Oregon coast” where he covered the topics of near-surface dynamics associated with separated jets in the CTZ off Oregon and bio-physical modeling and hypoxia in the Oregon coastal ocean. In the second day, July 23, he spent mainly with Fernando Gilbes, the director of the GERS Lab. He described him the projects dealing with assessing primary production and suspended sediments in the Mayaguez Bay and processing the satellite images and developing algorithms to interpret them. He also showed him the facilities, including the experimental laboratory and the GIS/ENVI laboratory where they process and interpret ocean color images. He also brought him to the study area – Mayaguez Bay and the mouth of the Guanajibo River. On the same day Andrey and Fernando visited Dr. Hamed Parsiani, head of the Electrical and Computing Engineering Department and principal investigator of the NOAA-CREST project at the UPRM. They discussed possible areas of collaboration in spite of the coming 5-year cycle of NOAA/CREST support. Dr. Parsianni showed him the LIDAR Laboratory for atmosphere sensing, the only one operating in a whole Caribbean basin. The same day, Andrey met Prof. Aurelio Mercado who works on modeling the tsunami waves in the Caribbean basin with ADCIRC and HYCOM models. They discussed the modeling details of the area. Magueyes Island, the field station of the Marine Science Department, was the venue of the NASA’s OSSCEE Workshop entitled Remote Sensing: Educational Tool to Understand Land and Marine Processes. This workshop took place during June 13 - 17, 2010 and was sponsored by the NASA project “Our Star the Sun Center for Educational Excellence”. It was a three and a half days retreat experience designed to introduce the fundamental concepts of remote sensing and applications to bring the real world into the classroom. The science and mathematics (STEM) teachers explored the powerful tool of satellite imagery as a resource for learning and discovery through interactive activities, exciting field trips, seminars, and exchanges with NASA and local experts. This workshop connected fifteen educators and experts in different fields in the venture to achieve educational excellence. One of the speakers was Fernando Gilbes, whom gave the seminar titled “Remote Sensing of the Earth System”. His presentation intended to give an overview of the available tools to monitor the four main components of our planet: geosphere, hydrosphere, atmosphere, and biosphere. In February of 2011, scientists from around the world will converge on Puerto Rico to discuss emerging science on Limnology and Oceanography in a Changing World. We are entering a new epoch, where anthropogenic impacts on climate are affecting our world in a myriad of yet to be understood ways. Islands, such as Puerto Rico, are particularly vulnerable due to rising sea level, increasing human populations, and stress on freshwater supplies. The goal of this conference is to bring together an international group of scientists determined to meet the challenge of the change upon us, exploring diversity and connections across the range of aquatic systems impacted by humankind. As part of the preparation for this important event in Puerto Rico the organizing committee met in the Puerto Rico Convention Center during March 15 and 16 of 2010. The conference co-chairs are Claudia Benitez-Nelson from the University of South Carolina, Jorge Corredor from the University of Puerto Rico at Mayaguez, and María González from Miami University. Also, several other people are part of the local committee, including Fernando Gilbes. This pre-conference meeting helped to start working with specific details like check the capabilities of the venue, discuss the selection process of the scientific sections, among other important issues. 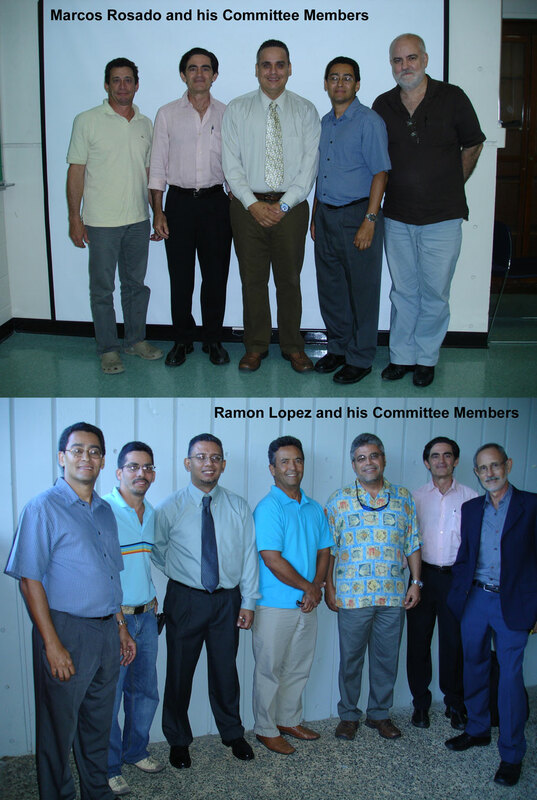 The Department of Geology from the University of Puerto Rico at Mayagüez carried out the 26th Annual Symposium on Caribbean Geology. This year the main topic was Advanced Sciences and Technologies for Geological Hazards Study and Mitigation. It took place during February 24-27 of 2010 in the Eugene Francis Hall of our campus. We had five invited speakers from the United States among other local researchers. The diverse presentations demonstrated how recent technology is advancing research on geophysical aspects, like tectonics and landslide. The symposium also included two field trips to areas affected by geological hazards. Spaceborne and airborne remote sensing allows a synoptic view of large areas of the Earth’s surface in a cost effective way. It has been successfully applied to mineral exploration, where metals in the substrate affect the spectral response of the vegetation growing on chemical anomalies. In order to test this technique in Puerto Rico, Johannes Schellekens and Fernando Gilbes are conducting a study supported by UPR-Sea Grant College that aims to investigate whether the changes in pigment synthesis can be used to discern metal contamination in mangrove wetlands. As part of a second phase of this project the undergraduate students Habib Bravo, Gabriel Mattei, and Kevián A. Pérez recently conducted two field samplings. The first occurred during February 5 of 2010 in Guánica, southwest of Puerto Rico, a pristine area with low amount of metals. This study site is far away from the coast; therefore a special arrangement was done with Dr. Roy Armstrong, professor in Marine Sciences Department, for going in his boat (R/V Boriken). Fernando Gilbes also participated in this sampling for training students in field work techniques. They collected samples of sediments and leaves from mangroves in Cayo Aurora, also known as Gilligan Island. The second sampling took place on February 27 of 2010 in Arecibo, north of Puerto Rico, a large contaminated area with metals. The selected site was barrio Islote, sector El Vigia, towards the lighthouse (at the surroundings of Club Nautico of Arecibo). In addition to samples of sediments and leaves, reflectance measurements of mangrove leaves were taken in Guánica and Arecibo with the GER 1500 spectroradiometer. All the data are now being processed in the laboratory. The Center for Hemispherical Cooperation in Research and Education in Engineering and Applied Science (CoHemis) carried out its seventh consecutive meeting on Remote Sensing and Geographic Information Systems, better known as PRYSIG (for its name in Spanish). 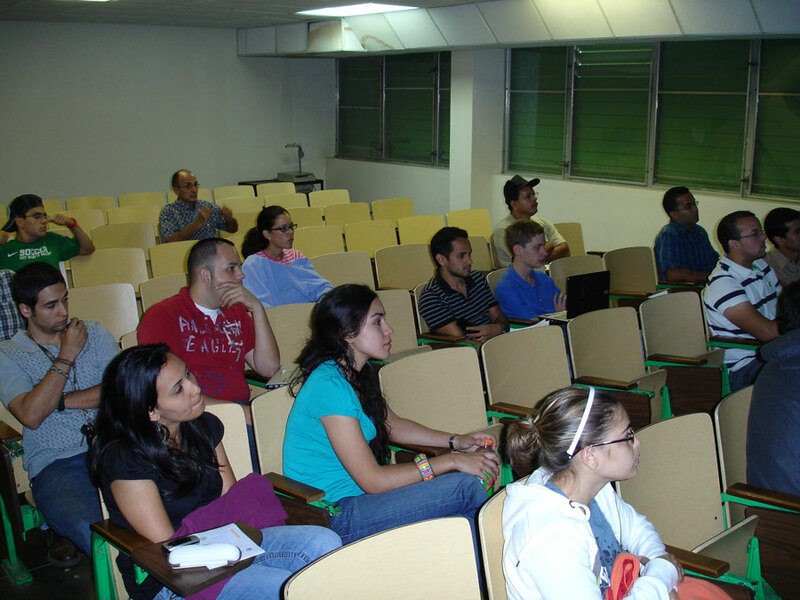 This activity took place in the Auditorium of the UPRM-Biology Building during December 11, 2009. As in previous years the activity attracted people from different sectors of our society; including academia, government, private companies, and general public. It was an opportunity to learn about the most recent work in Puerto Rico that uses these tools to solve diverse problems. PRYSIG 2009 also included two workshops using ENVI and ArcGIS allowing the participants to have a direct contact with that powerful software for image processing and GIS. The ENVI workshop took place in the computer lab of the Geology Department in collaboration with the GERS Lab. 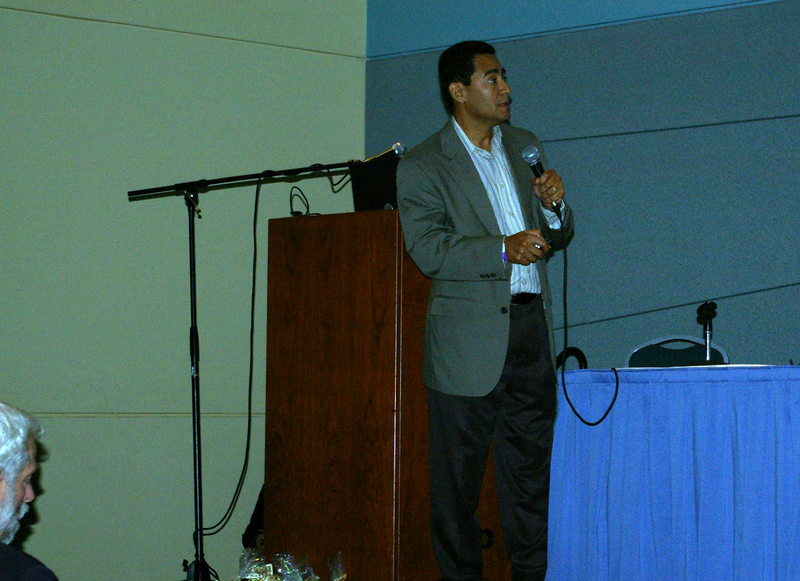 This workshop was offered by William Hernandez from GMT Corporation. Variations of total suspended sediment (TSS) in Mayagüez Bay and their relationship with inland soil erosion rates were the main objectives of the research conducted by Vilmaliz Rodriguez. In December 8, 2009, she presented the results of her work and successfully defended her thesis. Several analyses were developed using in situ remote sensing reflectance, backscattering, and TSS data collected on research cruises carried out between January 2004 and October 2006. The field data were compared with images from MODIS. The analyses identified the range between 589 nm to 645 as the target spectral region to estimate TSS, and showed the potential of using red to green ratios to improve these estimations. This study incorporated an innovative methodology which used satellite derived TSS products to estimate suspended sediment load in order to compared coastal variation with inland soil erosion estimations. Geographic Information Systems techniques were incorporated in this analysis by applying the Revised Universal Soil Loss Equation (RUSLE) to Mayagüez Bay watershed. Results of this study represent an important advancement in the development and application of Remote Sensing and GIS based studies in tropical coastal waters. Remotely estimation of nutrients concentration in the water column has been a very difficult task, especially in the tropics. However, that did not stop the doctoral student of civil engineering, Luis Campos, to conduct a research in this field. Actually he successfully defended the dissertation on December 4, 2009. The project was entitled “Identifying Total Phosphorus Spectral Signal In A Tropical Estuary Lagoon Using An Hyperspectral Sensor And Its Applicaton To Water Quality Modeling”. This project was conducted by the guidance of Fernando Gilbes and the financial support of the Puerto Rico Water Resources and Environmental Research Institute through the GERS Lab. The study site was the San Jose Lagoon (SJL), which is located in the northern coast of Puerto Rico. In February, May, and August, 2006, the Hyperion hyperspectral sensor collected images over SJL while field data was collected. A reflectance determination coefficient of 0.49 was obtained from the 467 to 529 nanometers bands ratio values, from which a polynomial algorithm was derived and used to produce a total phosphorus distribution map. While it is recognized that TP has no unique reflectance spectral signal (which can be confused with reflectance from other water constituents) this study demonstrates the application of total phosphorus possible spectral indexes to monitor its content in eutrophic tropical lagoons though a hyperspectral sensor. Luis research opens the door to future studies in this topic. Puerto Mosquito Bay (in Vieques) and La Parguera Bay (in Lajas) are two of the most important bioluminescence bays in the World. However, even when Puerto Rico has these two marvelous bays there had never been a symposium dedicated to this topic in the island. This is why the Vieques Conservation and Historical Trust hold the First Symposium on Bioluminescence of Puerto Rico. This event took place at the Multiple Use Center in Isabel II, Vieques, on October 9 and 10 of 2009. This symposium was also one of the activities commemorating the Trust twenty-fifth anniversary. The event, whichwas sponsored by the private sector, the government, and the academia, reunited hundreds ofpeople including scientists, students, professors, fishermen, business people, government agency personnel,and political figures. During the symposium several specialists in bioluminescence presented their mostrecentwork. Some of them were Drs. EdithWidder, Michael Latz, Juan Gonzalez Lagoa and Miguel Sastre.Other people working in related areasalso presented, among them were Dr. Fernando Abruña (Architect),Ms. Elizabeth Padilla (Biologist), and Dr. Fernando Gilbes (Oceanographer). Dr. Gilbes, from the GERS Lab, presented the work titled “Comparative study of the conditions in La Parguera and Puerto Mosquito: the dangers of sedimentation and development pressure”. This talk summarized the research conducted by his group with the sponsored of the Sea Gran College Program.The symposium exceeded all expectations and produced new initiatives and collaborations for preserving and manage these important bays. Congratulations to the organizers! 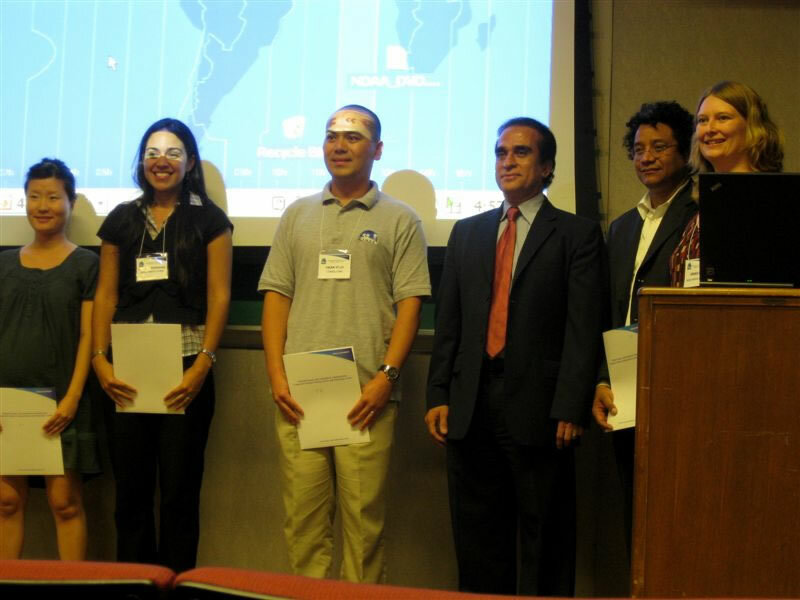 During August 18 and 19 of 2009 Vilmaliz Rodríguez visited College University of New York to participate in the Sixth Annual NOAA/NESDIS/STAR CoRP Symposium. This event was focused on presenting new approaches and methods to maximize the retrieving of information from remote sensing data. Presentations consisted in thirty orals and thirty three posters of several Universities with participants programs. Vilmaliz, who is sponsored by NOAA–CREST presented part of her thesis work in a poster titled: Estimating Total Suspended Sediments in Tropical Open Bay Conditions using MODIS. This poster was awarded with a third place. The graduate student Yadira Soto Viruet participated in a summer internship with the US Geological Survey in Reston, VA. She worked for the Minerals Information Team (MIT) that annually reports on the minerals facilities of more than 180 countries. MIT collects and analyze information on mineral facilities showing the production of metals, industrial minerals and fuel minerals. The work was to create a database using the Structural Table of Mineral Industry, which includes the location of main mineral commodity sites for two regions; Africa and Middle East and Commonwealth of Independent States. The mineral facilities database included mines, plants, location, commodity, company information, annual production capacity. The collected data were incorporated into Geographic Information System (GIS) using ArcGIS software to produce a map showing the mineral facilities. The database and maps assist in the analysis of availability and trade of mineral commodities for the U.S. economy. Also serve for the estimation of future production for different commodities from individual countries, regions and the world’s global market; and show the distribution of resources. The maps will be used to complete a world-wide project that shows the mining and production of mineral commodities globally. As in the last summer (2008), the graduate student Natlee Hernandez worked as part of the Eastern Geographic Science Center under the supervision of Dr. John Jones, a geographer of the U.S. Geological Survey. This was her second internship at the USGS and she worked as physical science tech. 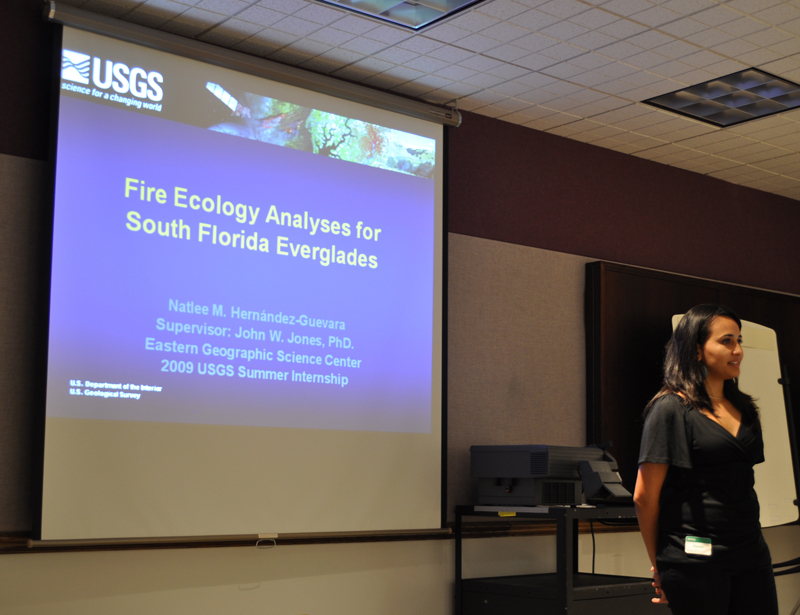 The project was about the fire ecology on the South Florida Everglades. A database was created to obtain a better understanding of the vegetation recovery rate. In order to create this database, Natlee used ENVI and ArcGIS. Unsupervised classifications were applied to the already delimited burned scars from 1986 to 2004. She obtained that the recovery rate varies from type of vegetation, water level, and date of the fire. The Center for Hemispherical Cooperation in Research and Education in Engineering and Applied Science (CoHemis) celebrated its fourth consecutive summer camp during July 13-19 of 2009. This year main topic was "Teaching Actively and Learning as a Team" and incorporated for the first time a workshop of remote sensing and geographic information systems (GIS). This component of the camp was organized by the GERS Lab. Fernando Gilbes, Vilmaliz Rodriguez, and Ramón López prepared an innovative game that included basic principles of image processing, GIS, and navigational skills using GPS. The participants used ENVI and ArcGIS in order to follow a series of clues until complete the game. Two groups were walking around the campus with a Garmin handheld GPS and other two were in the computer laboratory working with an aerial photo of the same geographic area. This game was based on the well-know game Geocaching and it was called Gerscaching. All participants enjoyed very much the activities and at the same time learned about these high-tech tools. Based on this positive experience it is expected to repeat this workshop in future activities. The ninety-fifth graduation of University of Puerto Rico at Mayaguez (UPRM) represented the ceremony with the highest number of doctoral degrees that has been conferred in that institution. Twenty-four students received their Ph.D. on June 12 of 2009. UPRM offers this degree since 1983 and it has been increasing its doctoral programs through time. This year the Department of Chemical Engineering graduated eight Ph.D. students, two were from Civil Engineering, two from Computing and Information Science and Engineering, six from Applied Chemistry, and six from Marine Sciences. Three students of the marine sciences program were working in topics related with remote sensing and bio-optical properties and closely collaborating with the GERS Lab. Deborah Cedeño and Marcos Rosado worked with Dr. Roy Armstrong and Ramón López was working with Dr. José M. Lopez. Marcos and Ramón also worked in the Mayagüez Bay project through a NASA and NOAA assistantships, respectively. 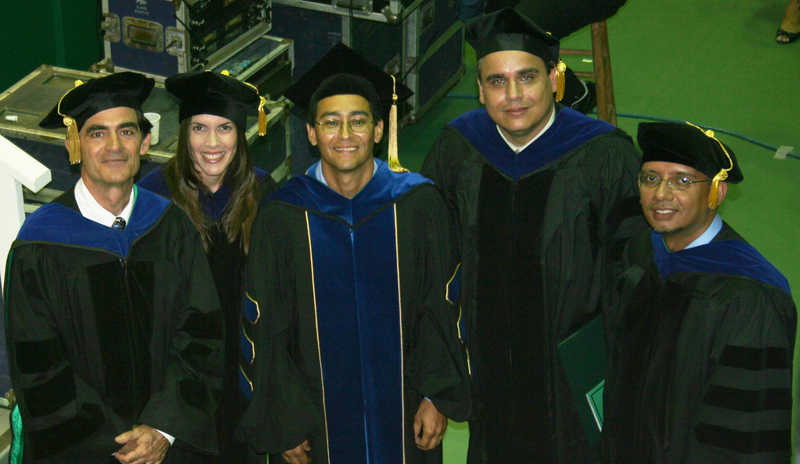 Dr. Fernando Gilbes was member of the graduate committee of all these three students. Estimation of suspended sediments using ocean color sensors, like MODIS, has been a major goal in our research of Mayaguez Bay, at western Puerto Rico. A large effort by Vilmaliz Rodriguez, master student of the GERS Lab, is finally giving good results toward that objective. She has tried several approaches in order to use MODIS Band 1 for that purpose and after some preliminary validation she is proposing a site-specific algorithm. This work is part of her thesis, but it was also presented in the 8th WSEAS International Conference on Instrumentation, Measurement, Circuits and Systems. This conference was held in Hangzhou, China, during May 20-22 of 2009. The presentation was titled “Estimating Total Suspended Sediments in Tropical Open Bay Conditions using MODIS” and it was published in the proceedings of the conference. An extended version of this work was also submitted for publication in a peer-review journal through the conference organizers. This represents the second submitted paper for Vilmaliz. The first paper was titled “Remote Sensing of Suspended Sediments in a Tropical Open Bay”, which is currently under revision in the Remote Sensing of the Environment journal. The XXVIII Symposium of Caribbean Flora and Fauna was focused on technology as a research and management tool for natural resources. 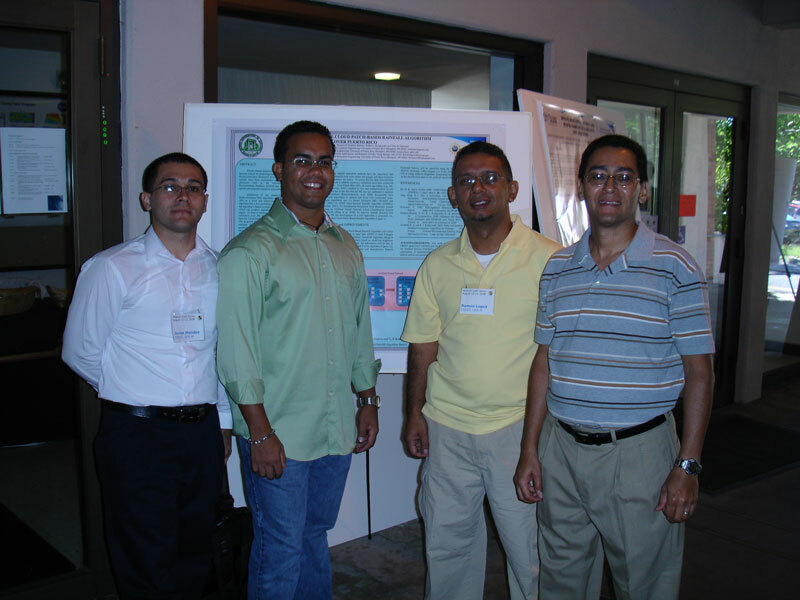 This annual symposium was celebrated during April 24 of 2009 in the University of Puerto Rico at Humacao and it was sponsored by the Department of Biology of that campus. Since this year main topic was closely related with GERS Lab work the organizers invited Fernando Gilbes to talk about how we are using technology in our research. His presentation was titled “Remote Sensing of Benthic Habitats in Southwestern Puerto Rico” and it was a summary of the past andpresent CenSSIS work, which focuses on how to improve the study and monitoring of these marine environments using image processingtechniques and optical properties. Also, during this symposium Vilmaliz Rodriguez presented a poster, but this time about hercurrent work with the US Department of Agriculture. 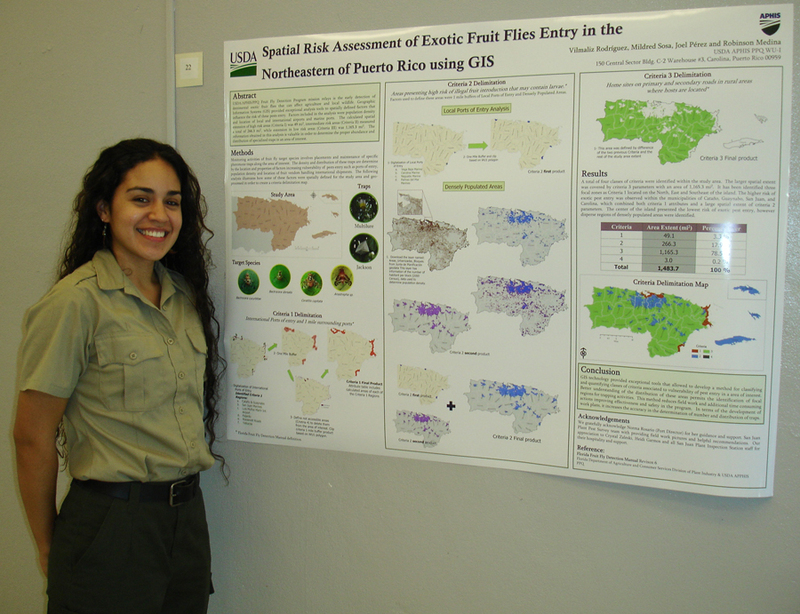 The title of her poster was “Spatial Risk Assessment of Exotic Fruit FliesEntry in the Northeastern of Puerto Rico using GIS”. Maria Vega and Carmen Zayas, graduate students of the UPRM Marine Sciences Department, also presented their thesis projects. The oral presentations of Maria and Carmen were titled “Remote Sensing of LAI and Net Primary Productivity of Red Mangrove Forests in Southwestern Puerto Rico” and “Habitat Fragmentation and the Distribution of the Sea Urchin Lytechinusvariegatus”, respectively. Other presentations discussed topics like characterization of forest canopies using LIDAR by Ralph Dubayah, forecasting honeybee production by Carla Restrepo and Diana Delgado, and evaluation of forest landscaping by Edgardo Gonzalez. NOAA-CREST research group celebrated an activity to promote the participation of new undergraduate and graduate students in this multidisciplinary project. 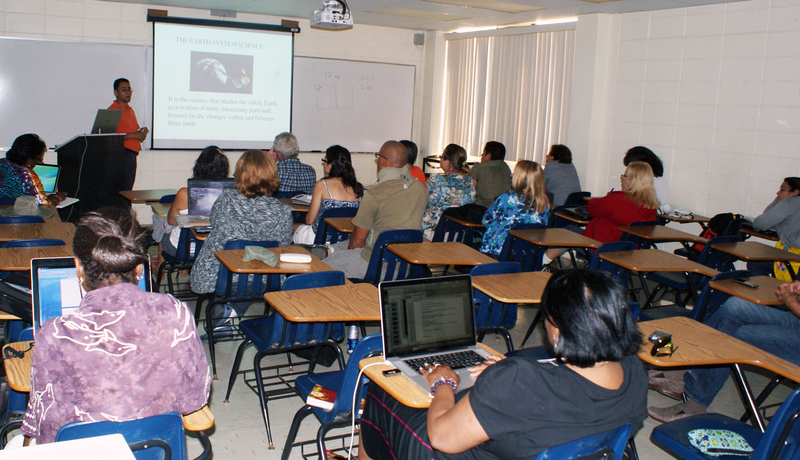 The NOAA-CREST Day took place in UPRM-Stefanni Building during April 23 of 2009. As part of the agenda different professors and students presented their current research activities and talked about their experience as CREST participant. One of those was Vilmaliz Rodriguez, whom presented her research in Mayaguez Bay and motivated other students to joint our group. Natlee Hernandez also participated for the first time, but she did not presented. This activity is celebrated every year in all NOAA-CREST institutions (including UPRM) and it aims to motivated students in getting involved with research areas of large interests for NOAA. In case of the GERS Lab, we would like to bring new students for working with remote sensing and biogeo-optical properties of coastal areas. 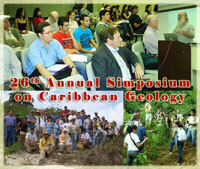 The Department of Geology of the University of Puerto Rico at Mayaguez celebrated its 25th Annual Symposium of the Caribbean Geology during April 15-18 of 2009 in the Eugene Francis Hall of the Physics Building. As in previous years, this symposium included oral presentations, poster sections, and field trips. However, this year’s activity coincided with the 25th anniversary of the Student Geological Society, which represented a unique opportunity to bring back together the alumni of the Geology Department. The expectations were fulfilled and graduates from different generations participated in the symposium and gave presentations of their current work. The GERS Lab was represented in the poster session by Yadira Soto, Vilmaliz Rodríguez, and Natlee Hernández. All of them presented posters related with their thesis work. Yadira’s poster was titled “Quantifying Shoreline Changes in Puerto Rico using Remote Sensing and Geographic Information Systems”. 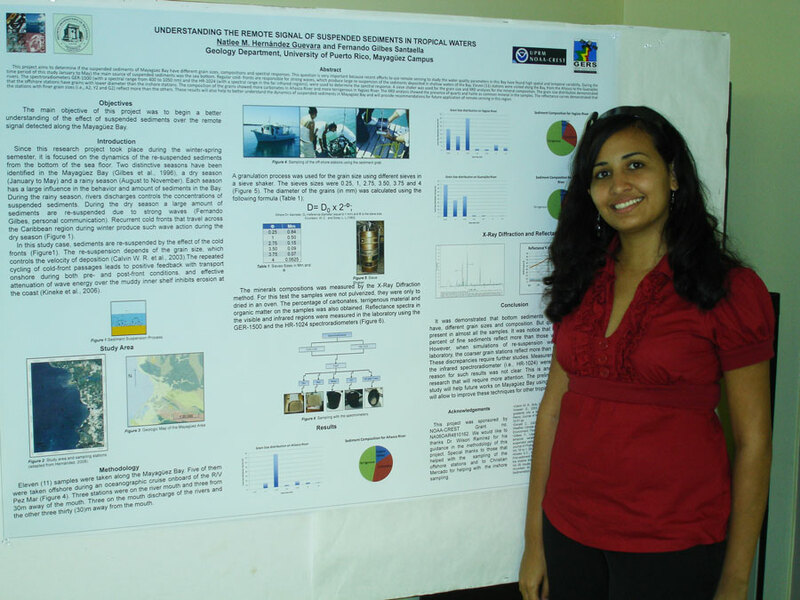 Vilmaliz’ title was “Remote Sensing of Suspended Sediments in a Tropical Open Bay”. And Natlee’s poster was “Effects of the Suspended Sediments on the Remote Sensing Signal”. Once again the state of the art research made by our laboratory is clearly demonstrated. Geographic Mapping Technologies Corp. (GMT) and the Center for Hemispherical Cooperation (CoHemis) organized a technological seminar about Geographic Information Systems (GIS) for governmental and academic applications. This activity took place during March 19 of 2009 in the Abbott Room of the Chemistry Building at UPRM and it was divided in two parts. The morning section was focused on how to integrate ArcGIS tools in teaching and research activities of UPRM. It was also presented to the audience the concept of "ArcGIS Campus Pack", an innovative program that will allow having a full campus license in a relative low cost. Most of the participants liked the idea and CoHemis committed to follow up on finding the way to implement this program at UPRM. As part of this section Fernando Gilbes Santaella was invited to talk about the “Geographic Information Systems (GIS) at GERS Lab”. He showed the applications of the GIS tools in oceanographic and coastal studies and explained the implementation of GERSVIEW. The afternoon section mainly covered topics on how to use these tools for government administration, including municipalities’ requirements and planning. Vilmaliz Rodriguez participated in a NOAA CREST site visit activity that took place in March 11, 2009 at the College University of New York. During the poster session she presented part of her work in a poster titled: Remote Sensing of Suspended Sediments in a Tropical Open Bay. She also had the opportunity of visiting the Coastal Remote Sensing laboratory facilities, where she was able to see innovative optic instrumentation and network with people with similar research interests. In addition, she was interviewed regarding her individual experience in the NOAA CREST Program by the CREST Evaluation Team in a closed door lunch session. Yadira Soto was informed in February 9 of 2009 that her application for the CNY-PR Alliance for Graduate Education and the Professoriate (AGEP) Fellowship was approved. The Central New York to Puerto Rico – Mayagüez (CNY-PR) AGEP program is seeking to expand the existing programs within each institution to the alliance. The CNY-PR alliance goal is to use holistic approaches to substantially increase minority SME Ph.D. degree recipients entering academic positions. The CNY-PR alliance is achieving this goal by providing inter-institutional engaging research experiences for undergraduate and graduate students. Yadira will use the funding from this fellowship to support her thesis research entitle “Quantifying Shoreline Changes In Puerto Rico Using Remote Sensing And Geographic Information Systems”. After more than 20 years of research in Mayaguez Bay this open bay in the western side of Puerto Rico is moving GERS Lab work toward a better understanding of the dynamics of minerals in the suspended sediments. This was the topic of Alexis Cruz Benitez, an undergraduate student of the Geology Department, whom successfully presented the project called “Spectral Effect Of Minerals In Sediments Of Mayagüez Bay” during this semester final presentations of all students registered in undergraduate research. 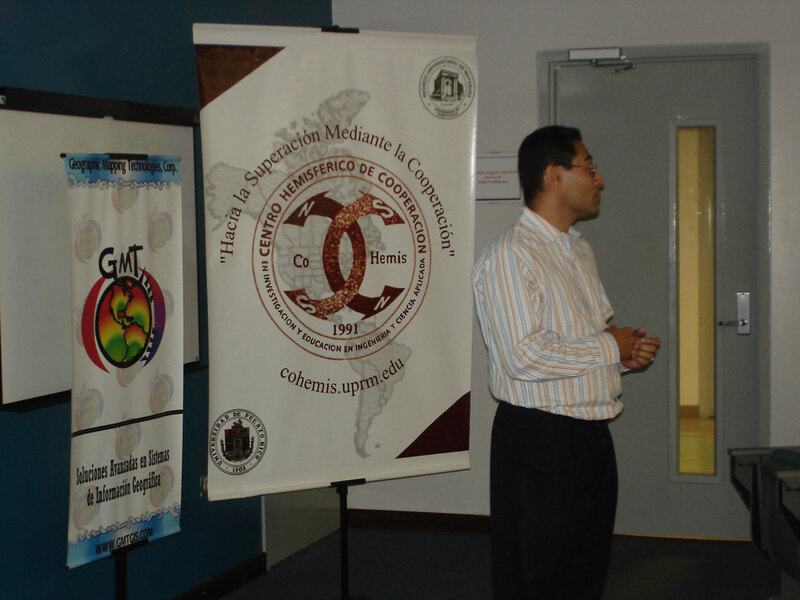 Alexis’ presented his work on December 9, 2008, which focused on the spectral response of minerals in suspended sediments from Añasco, Yagüez and Guanajibo rivers. He compared samples from three stations (Dentro, Boca and Playa) at each river. Water samples were collected in September 21 and September 26, 2008. Remote Sensing Reflectance (Rrs) was obtained using the GER-1500 spectroradiometer. A laboratory procedure was also developed and tested. The results will help to develop other studies in Mayaguez Bay and will provide recommendations for remote sensing applications. At the end of this fall semester of 2008 four graduate students from the Marine Science Department successfully defended their thesis. 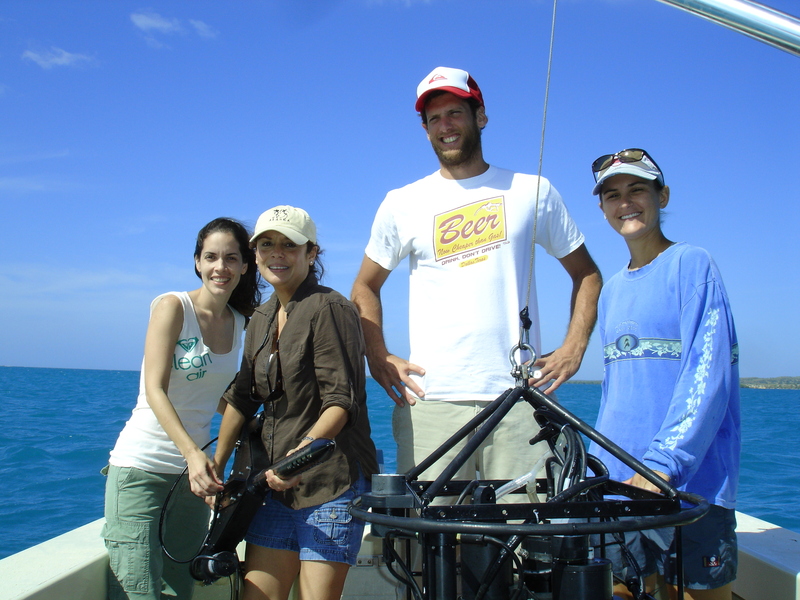 Marcos Rosado-Torres (worked in Mayaguez Bay), Deborah Cedeño-Maldonado (worked in La Pargera Bioluminescence Bay), and María Vega-Rodriguez (worked in La Parguera Keys) were supervised by Dr. Roy Armstrong and conducted projects related with ocean optics and remote sensing of coastal waters. Ramón López worked with the bio-optical dynamics of eddies in the Eastern Caribbean Sea and his advisor was Dr. José M. López. All these projects were linked with current research in the GERS Lab and Dr. Fernando Gilbes was part of their thesis committees. Specific details of each project can be found in the table below. The Center for Hemispherical Cooperation in Research and Education in Engineering and Applied Science (CoHemis) celebrated its sixth meeting on Remote Sensing and Geographic Information Systems (PRYSIG, for Spanish) during November 14, 2008. This meeting contained 9 oral presentations and 2 workshops that were attended by people from academia, private sector, and government. One of the presentations was given by Ramón López and Vilmaliz Rodriguez, graduate students supported by our NOAA-CREST project. Their talk was titled “Remote Sensing and Bio-Optical Properties of Mayaguez Bay”, which represented a summary of the most recent efforts for understanding the dynamics of this ecosystem. Once again we are part of this important event, which has become a tradition among this community of technical experts. As in previous years the GERS Lab participated in the annual open house of the Earth Science Week that is traditionally organized in the UPRM by the Puerto Rico Seismic Network and the Department of Geology. 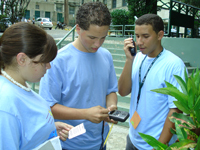 This year the activity received over 2,000 students from different schools around the island and took place in the UPRM Gymnasium during October 10, 2008. GERS Lab exhibition included a demonstration of taking reflectance measurements using the GER spectroradiometer. The bio-optical rosette was also shown and its application for remote sensors calibration was explained. Participants had the opportunity of looking a high resolution aerial photography of the UPRM campus and watch diverse images of Earth from space. The exhibition was presented by Ramon Lopez, a Ph.D. student of the Marine Science Department, Yadira Soto, a Master student, and Alexis Cruz, an undergraduate student, both of the Geology Department. The objective was to introduce the innovative research tools of remote sensing and demonstrate their importance to future generations of professionals. 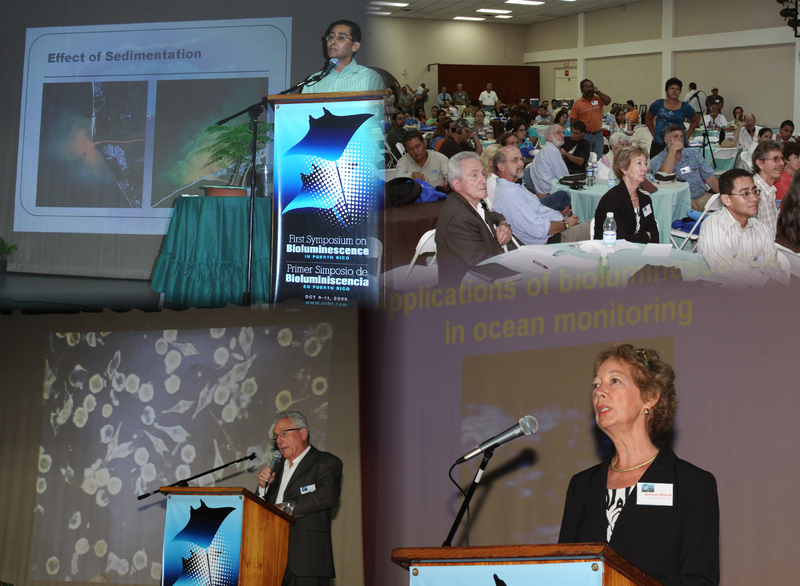 The University of Puerto Rico Sea Grant College Program (UPRSGCP) carried out its "Third Annual Symposium for Coastal and Marine Applied Research” during October 8, 2008. This activity brought together researchers who have received grants from UPRSGCP since 2006. The presented projects focus on problems affecting our coastal and marine resources. The presentations emphasized on the applicability of research results. During this symposium two researchers from the GERS Lab showed their projects. Fernando Gilbes talked about “New Web Tool for Understanding Bioluminescent Bays” and Johannes Schellekens about “Developing a Protocol to Use Remote Sensing as a Cost Effective Tool to Monitor Contamination of Mangrove Wetlands”. The students conducting research in the GERS laboratory had their first meeting of the semester during September 11, 2008 in the conference room of the Geology Department. Every student gave a short presentation about the proposed work and listen to comments and suggestions of the other participants. 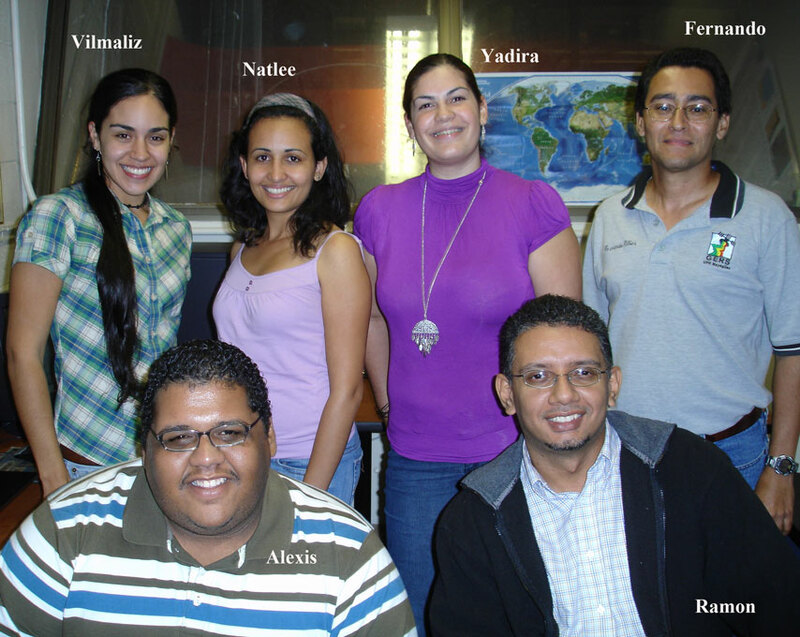 Vilmaliz Rodriguez and Yadira Soto are the current graduate students of Geology conducting their thesis with Fernando Gilbes. Vilmaliz is supported by NOAA-CREST to investigate the “Spatial and Temporal Variations of Suspended Sediments in Mayaguez Bay associated with Landward Soil Erosion Rates”. Yadira is working on “Detecting Shoreline Changes in Puerto Rico Using Remote Sensing and Geographic Information Systems”. Ramón Lopez, a Ph.D. student of the Marine Science Department, is also supported by NOAA-CREST for the “Development of the On-Line Database of Mayaguez Bay”. Alexis Cruz in conducting his first undergraduate research entitled “Spectral Effect of Minerals in Sediments of Mayaguez Bay”. And Natlee Hernández performed her both undergraduate research in topics related with the “Suspended Sediments of the Mayaguez Bay”. During this past summer Natlee worked at the USGS and she is now considering graduate studies at UPRM-Geology with Fernando Gilbes as advisor. This group will meet again at the end of the semester to present a progress report of their research. The application of remote sensing techniques for ocean dynamic studies is a common objective of two very distant NOAA Centers. In Puerto Rico, the coastal component of the Cooperative Remote Sensing Science and Technology Center (CREST) is using ocean color sensors for the estimation of water quality parameters. In Oregon, the Cooperative Institute for Oceanographic Satellite Studies (CIOSS) uses several techniques, like microwave and ocean color, for remote sensing research and modeling of the ocean. Therefore, to explore the possibility of collaboration, the organizers of the CIOSS 5th Annual Cooperative Research Program (CoRP) Science Symposium invited CREST researchers to participate. This symposium took place August 12-13, 2008 at Gilfillan Auditorium on the Oregon State University (OSU) campus. The theme for the Symposium was “Data-Model Fusion – Use of Satellite Data with in situ Data and Models,” covering everything from simple data-model comparisons to complex data assimilation. Ramón Lopez, a graduate student of UPRM-Marine Sciences Department and working in CREST, presented a poster of his dissertation project about oceanic eddies. In addition, two other graduate students from engineering and working in CREST with non-ocean applications presented their posters. Fernando Gilbes also attended the symposium as part of the invitation from CIOSS Director, Ted Strub. 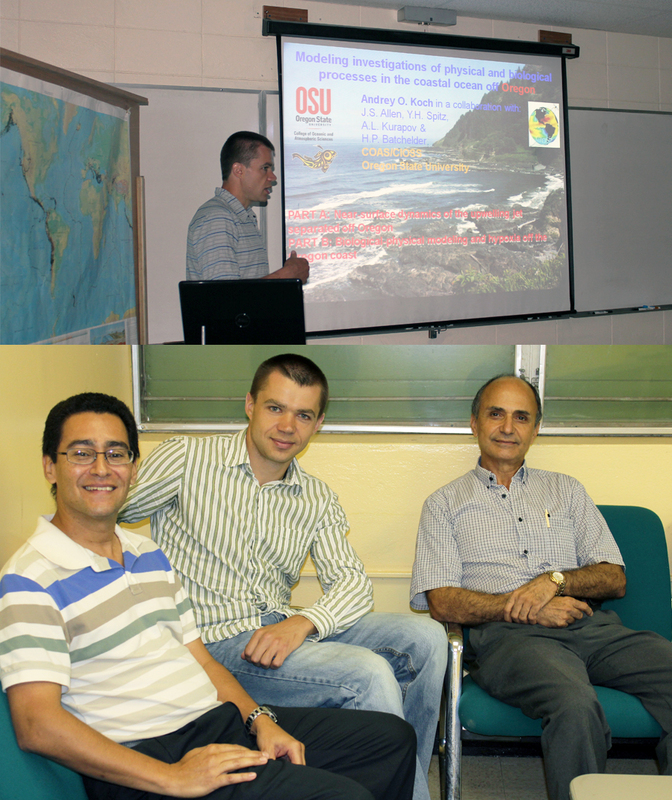 He stayed at OSU an extra day to give the Departmental seminar titled “Challenges and Opportunities of Remote Sensing in Caribbean Coastal Waters” and met several researchers to discuss possible collaborations. This visit has allowed learning more about the interests and current activities of these two NOAA groups and hopefully will open channels for near-future collaborative projects. 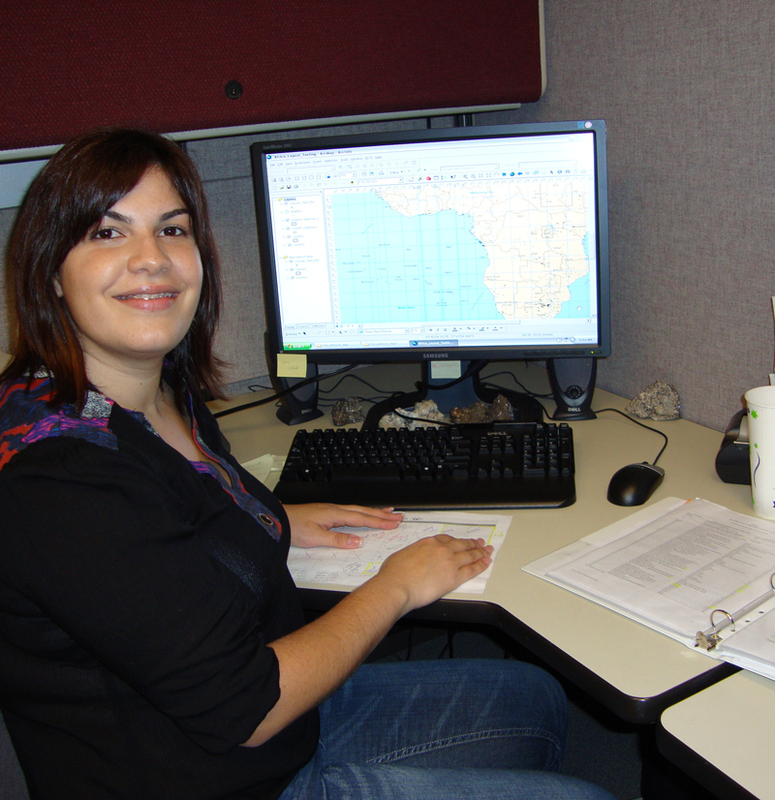 This past summer of 2008 Natlee Hernández worked as Remote Sensing Technician during an internship for the Eastern Geographic Science Center Division in Reston, Virginia, at the National Center of the U.S. Geological Survey. Her supervisor was Dr. John Jones, a Researcher Geographer. She worked in the project called “Calibration of 2005 Imagery in South Florida Everglades” as part of the main project titled “South Florida Landscape Dynamics”. The principal objective of this project is to develop and apply innovative remote sensing and geographic information system techniques to map the distribution of vegetation and related hydrologic variables such as evaporation through space and time. Natlee worked with images from two sensors, MODIS and TM, collected on the Everglades during 2005. As part of her tasks was to create NDVI products, use METRIC and Simplified codes to get evapotranspiration outputs for TM atmospherically corrected and compare them with the uncorrected imagery. MODIS imagery was downloaded, the coordinates were changed to UTM and a same geographic subset for TM imagery was created. Her results showed that the Empirical Line atmospheric correction method was effective for the TM imagery. “This internship was a great experience because I learned other ways to use the Remote Sensing Technique” she described it. 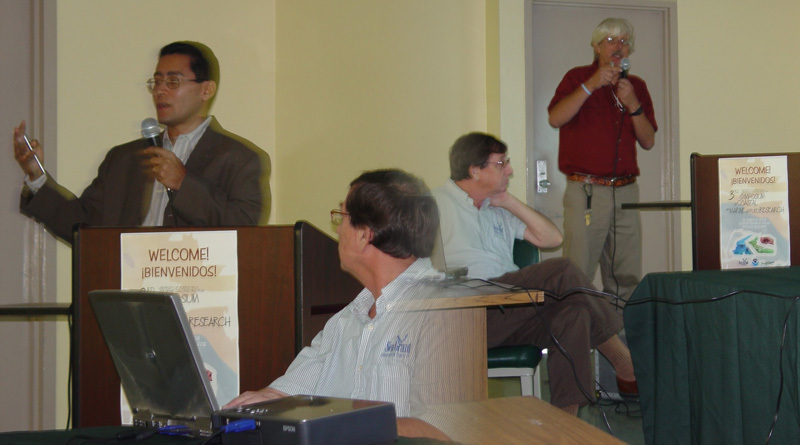 As part of our collaboration with the Bio-Optical Oceanography Laboratory (BIOL) Fernando Gilbes was invited to give a talk about Remote Sensing of Climate Change during the Puerto Rico Weather Camp 2008. His presentation took place in the planetarium of the Physics Department of UPRM on July 17 and over 15 high school students listened to him. Yasmin Detres, researcher at BIOL, was the coordinator in UPRM of this annual event organized by the NOAA Center for Atmospheric Science (NCAS). This year camp also received the collaboration of the Atmospheric Sciences and Meteorology Program of UPRM and the Meteorological Society of Puerto Rico-Student Chapter. Students were engaged in hands-on activities, field experiments, seminars, tours of research facilities, and workshops that expand their knowledge of atmospheric sciences, weather and forecast models, and environmental instrumentation. Medtronic was founded in 1949 by Earl E. Bakken and the late Palmer J. Hermundslie. Since developing the first wearable external cardiac pacemaker in 1957 and manufacturing the first reliable long-term implantable pacing system in 1960, Medtronic has been the world's leading producer of pacing technology. Today, Medtronic is the world's leading medical technology company, providing lifelong solutions for people with chronic disease. Headquartered in Minneapolis, Minnesota, their operations are primarily focused on providing therapeutic, diagnostic, and monitoring systems for cardiovascular, neurological, diabetes, spinal, and ear, nose and throat markets. Medtronic opened manufacturing facilities in Puerto Rico by the end of the 1970s and recently their operations in Villalba have been expanded. As many other companies in Puerto Rico, the office of safety and security from Medtronic in Villalba celebrated their annual environmental fair during June 25, 2008. This year they got interested in renewal energy and invited Fernando Gilbes for a lecture in this topic. During that day he talked about diverse ways of generating energy with water, a revised version of the same lecture he has been offering in different places. 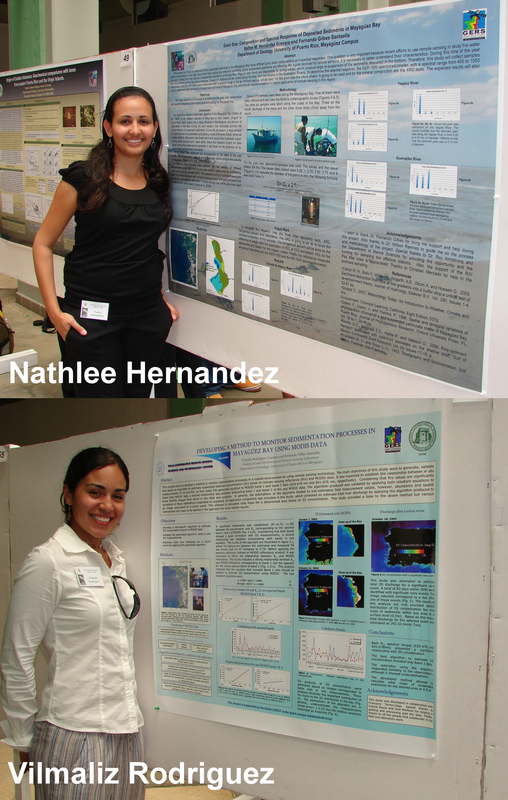 Ivelisse Lopez and Natlee Hernandez successfully defended their undergraduate research during May 8, 2008. Ivelisse in her second research project used a Geographic Information System (GIS) to assess the risk of a earthquake in Mayaguez city. She used two equations based on different rationale and created two risk maps that were analyzed. The resulting maps identified areas of Mayagüez at different risk zones and clearly show that the coastal area is at more risk than the mountainous area. The whole city of Mayagüez and particularly the urban areas should be studied in more detail using additional GIS coverage layers for the city such as liquefaction hazard maps or tsunami hazard maps. On the other hand, Natlee in her also second research project analyzed the grain size, composition and spectral response of deposited sediments in Mayagüez Bay. The grain size distribution demonstrated that the offshore stations have grains with lower diameter than the inshore stations. The composition of the grains shows more carbonates on Añasco River and more terrigenous in Yagüez River. Along the three rivers was showed the lack of organic matter. These results helped to better understand the dynamics of suspended sediments in Mayagüez Bay and provided recommendations for future application of remote sensing in this region. Fernando Gilbes has been involved in several initiatives of renewal energy as part of his work in CoHemis.That is why he has prepared a 45 minutes presentation on how to produce energy with water. As oceanographer, Fernando has also started a collaboration that aims to test a new invention to generate energy with waves. Since the potential of generating energy with water in Puerto Rico, including waves, is enormous several people and groups have invited Fernando to give his lecture, which is titled "Diversas Maneras De Generar Energia Con Agua En El Planeta". The most recent appearance occurred in San Juan during May 2 of 2008 as part of an international conference of renewal energy. As in previous years, students from the GERS Lab presented at the Sigma Xi poster day. 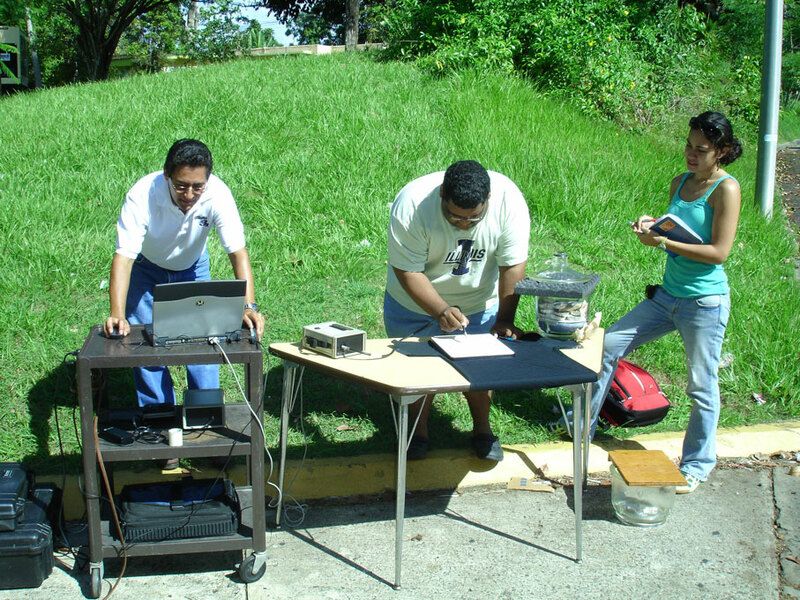 The activity took place during April 10, 2008 at UPRM-Chemistry Building and this year two posters were presented by Natlee Hernandez and Vilmaliz Rodriguez. They both presented their work performed in Mayagüez Bay. 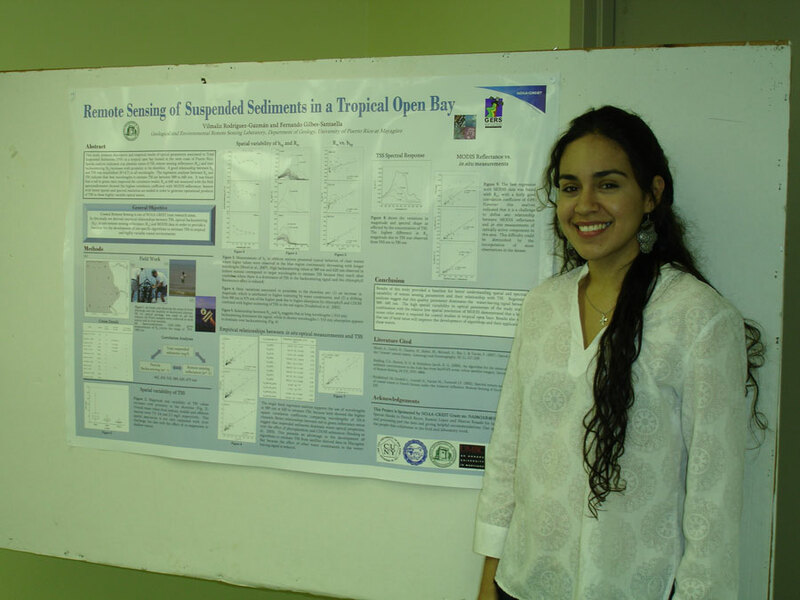 Natlee's poster summarized her undergraduate research and it was titled "Grain Size, Composition and Spectral Response of Deposited Sediments in Mayagüez Bay". 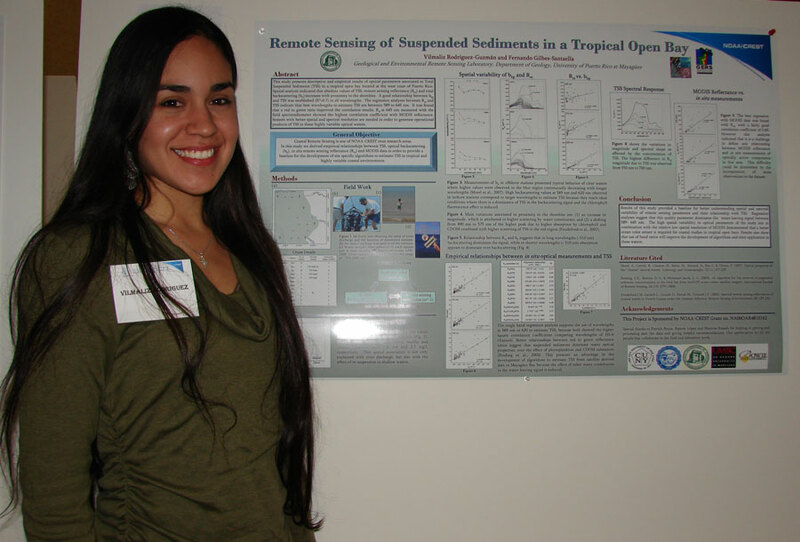 The poster prepared by Vilmaliz included part of her master thesis and it was titled "Developing A Method To Monitor Sedimentation Processes In Mayagüez Bay Using MODIS Data". The application of remote sensing techniques to the study of coral reefs is still limited by the lack of knowledge of the dynamics of the water optical properties. In order to remove the water column from the remote signal and study the bottom conditions in a coral reef is necessary to understand the spatial and temporal variability of IOP's and AOP's. This is the main objective of the most recent effort of our component in the CenSSIS project. Monthly sampling of bio-optical properties are carrying out in La Parguera reef system along 6 different stations. The most recent sampling was performed during March 26, 2008 and the students of the graduate course CMOF 8446 (Oceanographic Remote Sensing II) participated. The bio-optical rosette and the GER-1500 spectroradiometer were deployed from the Boriken boat. Fernando Gilbes and Roy Armstrong have a long time collaboration of research and education. They are both working with optical properties and remote sensing. As part of this collaboration Fernando gave the lecture titled "Relationship between the inherent and apparent optical properties" in Roy's graduate course CMOF 8446 (Oceanographic Remote Sensing II) during March 24, 2008. The lecture reviewed important topics already covered in the course and presented new ones very important for the application of remote sensing in environmental studies. 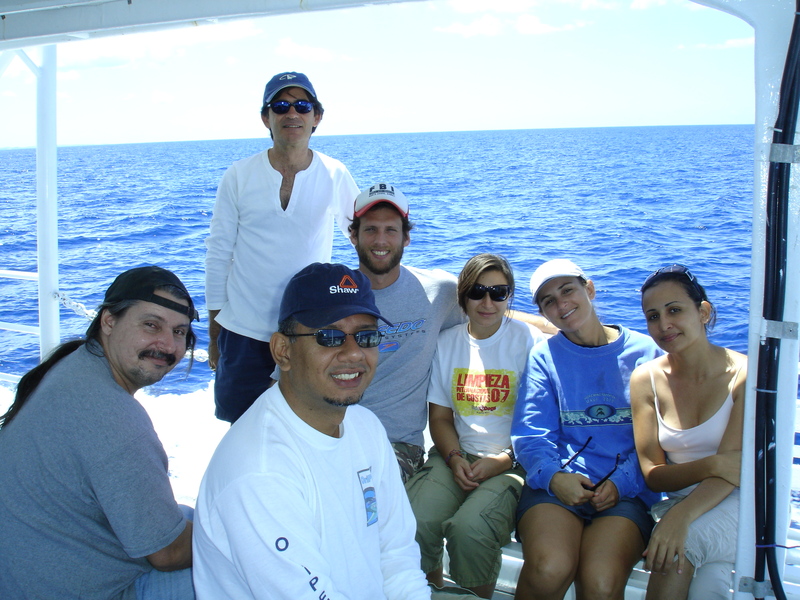 During March 12, 2008 a bio-optical sampling in Mayagüez Bay was carried out as a teaching experience of the graduate course CMOF 8446 (Oceanographic Remote Sensing II), given by Dr. Roy Armstrong in the Department of Marine Sciences. The students had the opportunity to deploy the bio-optical rosette, make measurements with the GER-1500 spectroradiometer, and collect water samples for Chlorophyll-a, suspended sediments, and CDOM analyses. The sampling also provided data of the dry season conditions in the Bay that will be incorporated in the long-term database that has been analyzed as part of the NOAA-CREST project of Dr. Fernando Gilbes. In addition, the cruise allowed to collect samples of the bottom sediments at different sites of the Bay as part of the project performed by Natlee Hernandez, an undergraduate student of the Department of Geology and working under supervision of Dr. Gilbes. One of the main research areas of our NOAA-CREST project is to develop a procedure to estimate suspended sediments in Mayaguez Bay using remote sensing. This effort has involved several undergraduate and graduate students that have been testing several sensors and algorithms. The results of this work were presented during the 24th Annual Symposium of Caribbean Geology that was held in the University of Puerto Rico at Mayaguez on February 29, 2008. This symposium was organized by the UPRM-Department of Geology and dedicated to the geologist Wayne Jolly, whom past away last month. 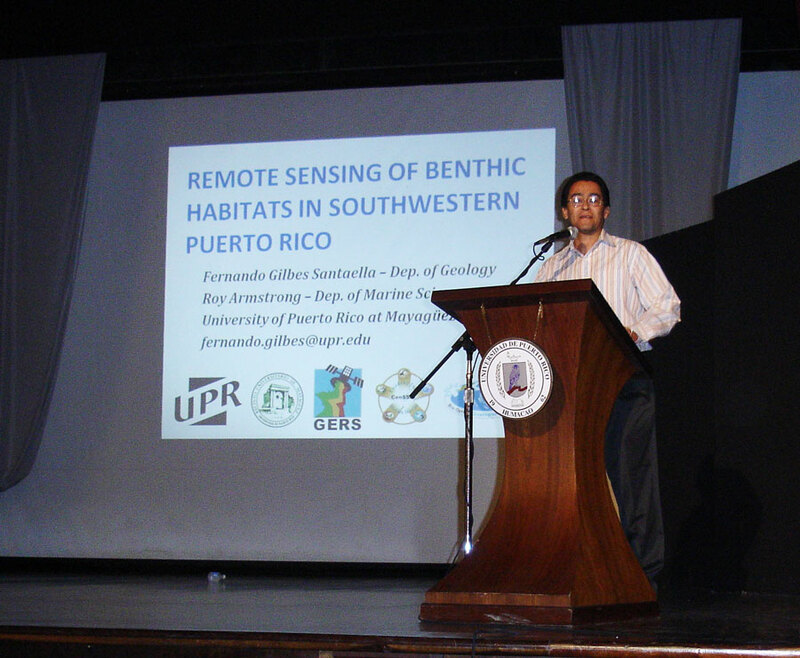 The talk was titled "Monitoring suspended sediments in Mayaguez Bay using remote sensing" and given by Fernando Gilbes. Other authors of this work were Vilmaliz Rodriguez, Jose Martinez, and Eidalia Gonzalez. During the past year ACEER (Alianza Ciudadana para la Educación en Energía Renovable) has organized conferences of renewable energy in the Cultural Center of the Mayaguez City. The main purpose of these conferences is to provide the most current information about this topic to the general public in order to help our island moving toward these technologies. 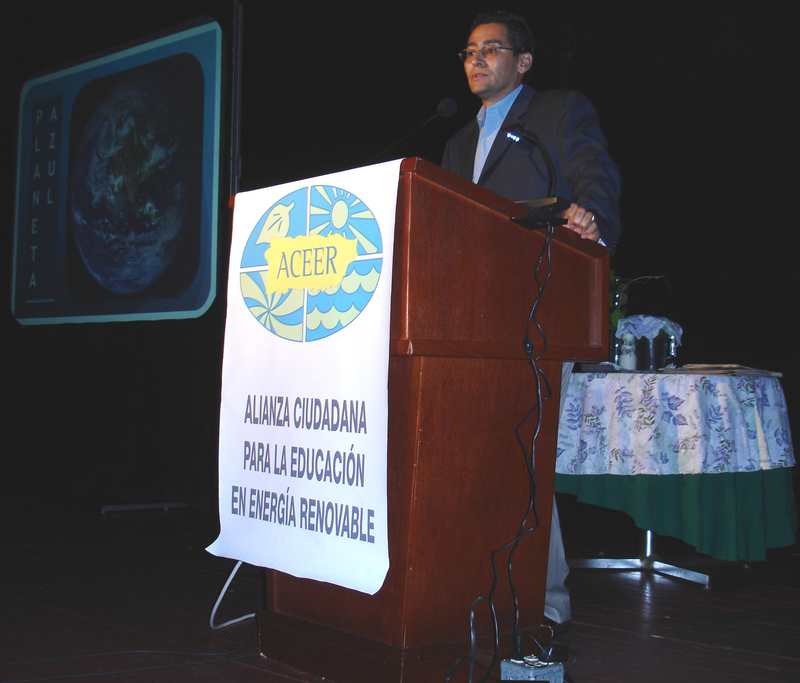 ACEER had the 5th conference during February 23 of 2008 about energy from water and invited Fernando Gilbes to give a talk. The presentation was titled "Diversas Maneras de Generar Energía con Agua en el Planeta" which exposed the diverse methods and most recent technology of getting energy with this renewable source. Ocean color of Mayaguez Bay has been part of the research efforts made by the GERS Lab since its foundation. In most recent years the work has focused on testing and validating the MODIS sensor. 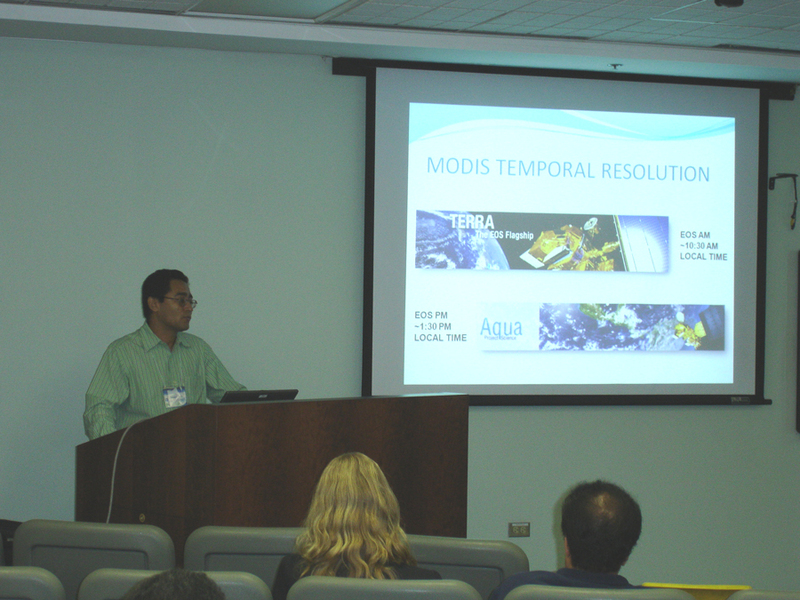 The results of such work were presented during this year NOAA-CREST Symposium that was held in the University of Puerto Rico at Mayaguez on February 21, 2008. The presentation given by Fernando Gilbes was titled "MODIS Validation for Water Quality Parameters in Mayagüez Bay" and presented image processing and analyses that clearly demonstrated how MODIS is not the most appropriate ocean color sensor for Mayagüez Bay. Another sensor with better temporal, spatial, and spectral resolutions is still needed for the estimation of Chl-a and suspended sediments in tropical coastal waters. The work also suggests that future work with MODIS in this region must improve the atmospheric correction, consider other sources of error like bottom and land signal, and removes contamination by CDOM. Other authors of this work were William Hernandez, Vilmaliz Rodriguez, Jose Martinez and Natlee Hernandez.